Wish I had remembered to bring my camera! I think this is the first show I didn't get a pic of every one and never did end up with one of me and Danny. It was such a blast! Can't wait for the next one! Thanks for the link to those beautiful photos. We hope you get to come next year and be in those pictures. The tentative date for the 2012 Arkansas Pen & Watch Show is March 23-25. We expect this show to continnue growing..
Continue to grow? Mauricio, there's no doubt about that!! Started a savings account for the 2012 show.... BWAahHAhAHhahahaaa! Fast, Cheap, Good... you can choose two. ....How fast can a year roll by? Depends... are we using USMCMoms way of counting? If so it should only be a few weeks.... or something like that! I would never do that to a fellow pen friend! Well, if those dates were nearer to the Philly show dates.........does anyone know those for next year?.............. I could do both! How I'd love to come to Little Rock - I hear the Lobster is very good there!!! By the way, and please excuse my manners, but four postcards landed here last week, covered in wonderful greetings from lots of people - Mauricio, your calligraphy is wonderful! Henry and Wendi, John Mortinson was behind them all, with Susan Wirth of course...........and so many lovely people!!! I meant to thank you ALL then, but somehow my desk became the site of sorrow when a pen was stolen from the mail to me - but I've bounced back - and will forever be looking for an Omas Autunno with tweaked fine nib! No....I like the way you count....Makes the wait that much shorter! John was so very nice to facilitate that...thoughtful fellow. What dreadful news about your pen! Did you ever touch the package? I am soooo sorry, Chris! so I did touch the package, opened it, then handed it over to the Australian PO for investigation - still waiting............. and no doubt we all know what they will say! March 23-25 was not a good option as it will be Spring Break in Arkansas. 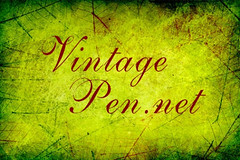 A new post will be created once we have all the details for the 2012 Arkansas Pen & Watch Show. We wanted to give you as much headup as possible so you can mark your calendars now. Looking forward to another huge round of pen fun next year! calendar marked ... in ink!